Chichester District Council is thanking its residents for increasing the district's household recycling rate to 45%! Since the council launched its recycling campaign in 2016, the recycling rate has increased from 39% to 45%. There has also been a significant reduction in the amount of household waste, which has fallen by 11% - which equates to 64kg of waste per household. "This is fantastic news," says Cllr Roger Barrow, Cabinet Member for Resident Services at Chichester District Council. "We want to say a huge thank you to our residents for making such a difference and we want to urge them to keep up the good work. Our aim is to recycle 50% of waste by 2020 and with everyone's continued support I think we can achieve this. "We've tried to make recycling easier for people and have run various initiatives across the district, and so hopefully people feel as though this has made a real difference. And, we are very grateful to the local media, supermarkets and other partners who have supported us in our efforts. "We also relaunched our Garden Recycling Service. The garden waste collected not only contributes to our recycling rate, but it is recycled locally into compost. This has been a huge success. Customers receive a green wheeled bin, which is emptied every two weeks for less than £1 a week when paid by direct debit. It makes a huge difference because you no longer have to move bags of garden waste to the tip and you're also making a massive contribution in helping us to recycle waste." To celebrate the increase in recycling, Chichester District Council is offering new customers that sign up to its Garden Recycling Service three months free (terms and conditions apply). All they have to do is sign up online and use the promotional code GARDEN186. 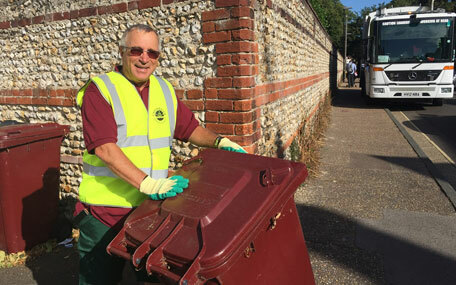 The council is also busy planning activities and events with the West Sussex Waste Partnership for Recycle Week 2018, which takes place between 24 and 30 September. Further information will be available at www.chichester.gov.uk/recyclingadvice nearer to the time. Residents who want to access further recycling advice and guidance can visit the Recycle for West Sussex website, or see the council's recycling advice, or email wasteandrecycling@chichester.gov.uk.